Yes, America, we are being lied to, again. Not only is this Boehner plan a hoax but it appears the Speaker is going after conservatives in the House. If true, Boehner should be primaried next year. When are we going to go after the RINOs, the "establishment" Republicans and the progressive Republicans? We should begin now. 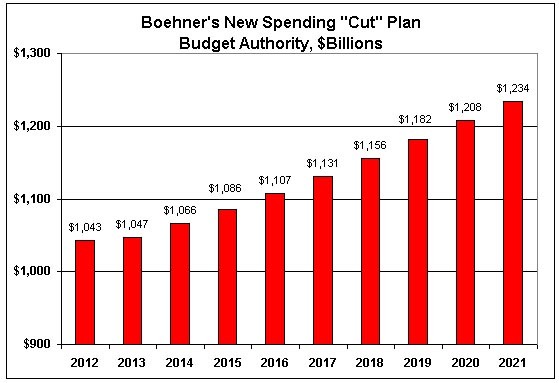 Actually, the revised Boehner plan doesn’t cut spending at all. The chart shows the discretionary spending caps in the new Boehner plan. Spending increases every year—from $1.043 trillion in 2012 to $1,234 trillion in 2021. (These figures exclude the costs of wars in Iraq and Afghanistan). Click here to read the story Mark Levin links to in the above tweet.